NCSM invites you to join us as we engage in the second reading from the Call to a Collective Action, From Awareness to Action: Equity and Social Justice in Mathematics Education. - “Excellence Through Equity” (Blankstein & Noguera, 2016), January – early March. We look forward to you joining us as we explore and plan to act on the five principles of courageous leadership - Getting to Your Core, Making Organizational Meaning, Ensuring Constancy and Consistency of Purpose, Facing the Facts and Your Fears, Building Sustainable Relationships. Continue building our collective knowledge and begin taking the actions needed to promote, develop and support a just, equitable, and sustainable system of math education for all children. Note that additional discussion questions and a discussion board will be available in the MyNCTM community, participants can join at https://my.nctm.org/home. Join us Wednesday, January 17, 2018 at 7:30 p.m. ET as NCTM host the first webinar The Impact of Identity in K-8 Mathematics: Rethinking Equity-Based Practices. In this webinar, the authors will provide a brief overview of The Impact of Identity in K-8 Mathematics, focusing on the supporting work and thinking of teachers, teacher leaders, and educators. The rest of the webinar will be organized around questions and dialogue with the authors. Questions will be taken from the chat as the webinar progresses. Those involved in the book study are encouraged to attend and submit questions ahead of time in the MyNCTM community. Register here. How can you students be a part of the 50th NCSM Annual Conference? As we celebrate 50 years of NCSM, we are reaching out to you to challenge your students to create a piece of art to commemorate NCSM’s 50th Anniversary. You could write problems that end in 50, create equations that would graph or end in 50, draw pictures or diagrams that relate to this in some way. Be as creative as possible. The piece of math art should be either 50th related, or NCSM related, or any combination thereof. We ask you to share this challenge with your students, teacher’s, coaches, principles, department chairs, everyone, because we want to showcase artwork from students, whether they are pre-K, through higher education, any and all are welcome. Leaders – we ask that you select 4-5 of the best pieces and send them to NCSM – PO Box 3406, Englewood, CO 80115. Please note that any pieces sent to NCSM become the property of NCSM and will not be returned. Please include on the Math Art the student name, teacher name and school. We would like to have our Math Art be representative of NCSM’s entire membership. Please submit these works soon and definitely before February 1, 2018. 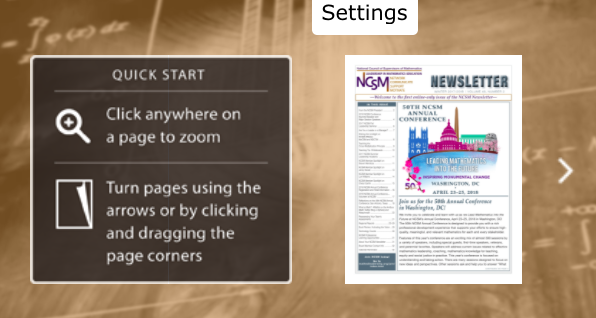 The NCSM Newsletter has gone digital. The new version of the newsletter can be accessed on any computer, smartphone, or tablet. As NCSM is gearing up to celebrate 50 years of memories, we are hoping to hear from you and see your memories. Share your favorite memories on Twitter, Facebook and Instagram using #NCSM50 and yours may be selected and highlighted at the conference and beyond! As we approach our 50th Annual Meeting in Washington D.C. this April we will continue to provide you with information about our conference. In the previous eNews I wrote about the Monday Night Celebration at National Geographic. There are still some tickets available for that event. Don’t wait too long as we are on track to fill up soon. The reception will not be the only time we celebrate. We would like you to have a chance to participate in additional ways. We invite you to share your congratulatory message via video. Whether by yourself or with a team of colleagues, and/or students. Be creative and have fun. The videos will be used throughout the year celebrating NCSM’s 50th Anniversary, in Social Media, at the Annual Conference, the fall seminars, and leadership academy. There are three ways to access this media. Or use the QR Code here and it will take you to the flipgrid with directions and links for downloading the app. Click the green plus button to record your video, you will have up to 15 seconds but it is not necessary to fill the entire time. You may review your video before you submit it. Click arrow after recording for the selfie screen. Don’t wear a nametag (or a shirt with a logo) – it reverses the name. Try to find a quiet location as background noise is easily picked up. Hold your camera vertical and above your face. Mix in both serious and fun! Retakes are possible, have fun and do not be critical of yourself. Be creative! You can wish NCSM a happy 50th Anniversary, thank NCSM for their 50 years of leadership, or share a favorite NCSM story*. We are looking forward to seeing your videos. *By submitting a video to FlipGrid, you agree that the video becomes the property of NCSM and can be used how and when NCSM sees fit. We are featuring two sessions, one focused on coaching and the other on equity and social justice. There’s something for everyone! Read more about the sessions here and register for the conference and the pre-conference here. If you've ALREADY registered for the conference and would like to add a pre-conference session, click the button below. Volunteering at the NCSM Annual Conference is a rewarding experience, providing you with opportunities to network and make new friends as well as contribute to an enhanced conference experience for all attendees. As Volunteer Recruitment and Management Chair, NCSM Second Vice-President, Bill Barnes, is seeking volunteers who can assist at the conference. Sign up to volunteer today! If your district/school has a coaching program or is thinking about starting a coaching program; join NCSM and their Coaching Team for the NCSM Summer Leadership Academy in Colorado near the Denver Airport – July 30 to August 1, 2018. Explore the themes and imperatives necessary for an effective Coaching program and to be an effective coach. You will receive tools and guidance in assessing where you are in your coaching journey and in the development of professional growth plans for you and/or your teams. Participants will be among the first to receive a copy of NCSM's new coaching book, NCSM: Themes and Imperatives for Coaching (working title). More information will be available soon. We are excited to be hosting this coaching theme for our Summer Leadership Academy. We hope you are, too, and that we will see you in Colorado at the end of July! Calling all Math Leaders who like music! On Wednesday, April 25 from 3:30 to 4:30, we will be presenting our Musical Tribute honoring NCSM’s 50th Anniversary. The presentation, telling the history of NCSM from the day of its founding to the present, requires a choir as well as some vocal soloists and musicians (second pianist, guitarist). You don’t have to be a professional singer or musician to participate. You just can’t be shy!!!! If you agree to participate, we will have one rehearsal prior to the performance. We will send you the music (old songs with new words) along with the narrative and logistics no later than mid-February (probably, sooner). If you want to join us, please send an email, no later than January 30, 2018, to Carole Greenes at [email protected]. If you are a musician, or if you are willing to do a solo, please let Carole know. As you may know, we are using a new system to distribute meal/event tickets this year. The conference registration form asks if you are interested in tickets for meals and receptions. If you said yes, watch your inbox beginning February 12th. Now that we have finalized the sponsors and speakers for each event, and you have a better sense of your conference plans, you will be able to request tickets for the meals you wish to attend. The emails will be sent in weekly waves, beginning with those who registered earliest for the conference. When your message arrives, you will have one week to request your meal tickets. For the earliest registrants, your email will arrive on Monday or Tuesday (February 12 or 13). You will have until Sunday night the February 18th to request your meal tickets. On Monday morning the 19th, the next wave of emails will go out so the next group of registrants can request their tickets from those available. Your request link will continue to work after the deadline for your group but there will be fewer tickets available. The earlier you registered, the sooner your message will come. If you've registered more recently, your email message may not come for a few weeks. 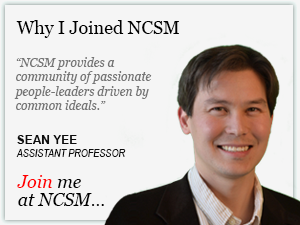 This system continues the NCSM tradition of giving priority access to meal tickets to those who register early. We hope it also makes tickets available to more conference attendees up front (without waiting list lines) because the request is not “all or nothing.” As usual, if you discover at the last minute that you cannot use a meal ticket, please return it to the registration desk so we can let someone else use it. We will continue to have wait-list lines at all meal functions except the off-site 50th anniversary celebration on Monday night.